Lewis Hamilton leads the pack at the 2016 U.S. Grand Prix. News of the state's denial of the reimbursement was first reported by the Austin American-Statesman. “The anti-trafficking plan was on file for other events throughout the year, so it is not a question of implementation,” it read. Executive Vice President Rick Abbott cited COTA’s anti-trafficking plan that was put in place for its MotoGP event last April and said the organization was hopeful for a resolution. “As the reimbursement for the 2017 USGP [U.S. Grand Prix] was not paid until ten months after the event, we remain hopeful the 2018 issues can still be resolved,” he said. The State of Texas Event Trust Fund provides a rebate on tax revenue gained from economic activity surrounding the events like the Super Bowl, NCAA Final Four and Formula 1. Theoretically, the rebate comes from tax revenue that wouldn't be there without the event. Before Formula 1 came to Austin in 2012, a 10-year incentive plan was approved by then-Gov. Rick Perry providing up to $25 million a year from the fund to COTA. In 2015, the rebate formula was changed under Gov. 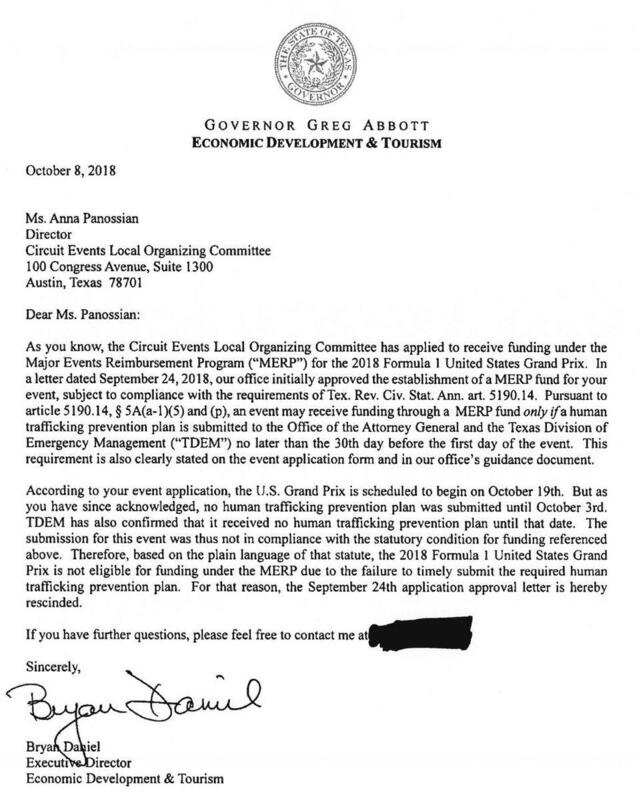 Abbott, and COTA was told it would receive around $5 million less than what was anticipated. That deficit nearly ended F1’s run at COTA, because the track effectively uses the money from the state to pay F1 the fee required to host a race.